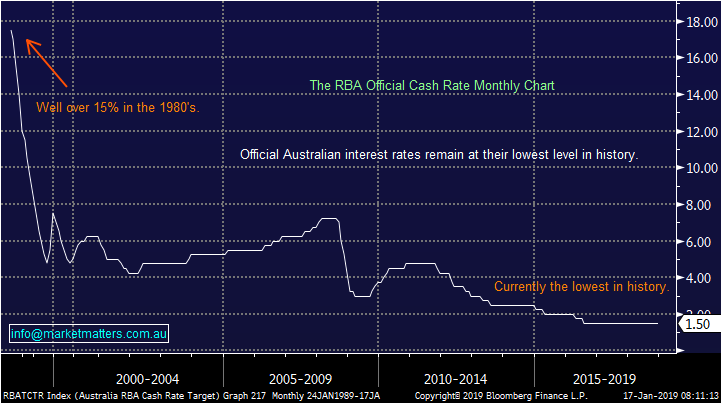 Are we headed for a rate cut in Australia? We witnessed an almost perfect “about face” last year from most of the market on interest rates with the start of 2018 all about rising interest rates / bond yields on the back of bullish economic & stock market predictions, while the second half focussed on a looming recession and hence falling bond yields – interestingly both scenario’s led to aggressive sell offs in stocks who appear to like things just as they are i.e. we’ve been in a sweet spot for assets for almost a decade and changing dynamics = more volatility. 1 – The market is expecting Australia to cut rates with a falling housing market undoubtedly having a huge impact here. 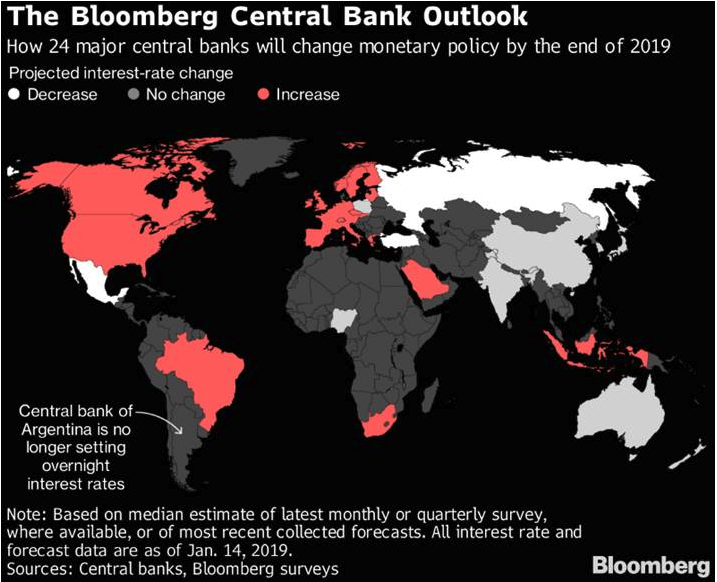 2 – The US Fed is expected to continue its path of raising rates. 3 – Most of the Emerging Markets are expected to maintain their current levels. The futures market is targeting a cut in local rates next year but we question whether trimming things further from the already lowest in history 1.5% will have any impact. The housing market which is scarring many is not falling because of interest rates, it’s been an engineered policy decision by bureaucrats who are now scarred they’ve gone too hard too fast – wouldn’t be the first time! While a downturn in the local property market is having a detrimental impact on consumer spending initially taking over 1% from growth, this is not yet pushing us into recession. For Australia to finally experience the “big R” China probably needs to keep slowing which would put pressure on commodity prices. However what matters the most to MM is what stocks will perform the best in 2019 due to the RBA’s actions, or perhaps their inaction. 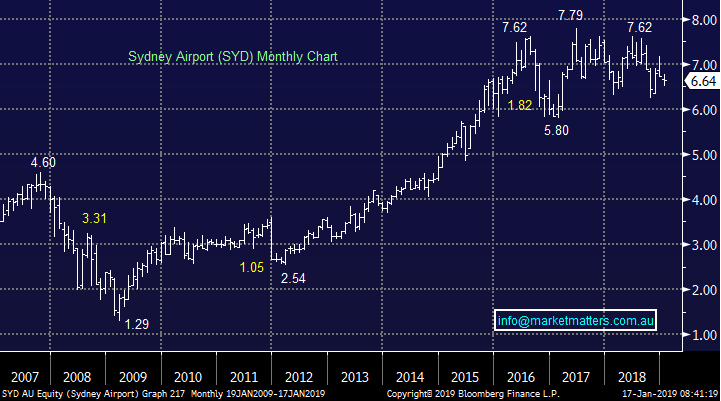 Over the last year the “yield play” stocks like Transurban (TCL) and Sydney Airports (SYD) have essentially trod water hence putting in a better performance than the underlying ASX200 which has been weak. That implies that lower rates have been factored into market / pricing of these sort of stocks. If we’re wrong and current market pricing is right what stocks would benefit? Property is the obvious one, however the main beneficiaries we think would have commercial / office exposure rather than residential given residential has a higher degree of emotional bias connected to it plus retail landlords would still struggle. Transport and utilities generally do well while infrastructure would rally from here – stocks generating overseas earnings would also benefit from the decline in currency. Overall, we remain in “sell mode” at current levels, looking to increase cash to buy future weakness. We do not believe the RBA will cut rates in 2019 or 2020 unless the economy deteriorates markedly. However we doubt rates will go up and will consider buying the “yield play” stocks if a suitable / risk reward opportunity presents itself.